← Would the World Be Better Off Without Religion? Last month’s conference in Princeton included two remarkable talks by prominent physicists, both of whom invoked philosophy in a manner unprecedented for this kind of scientific gathering. On the first day, Paul Steinhardt attacked the current practice of inflationary cosmology as able to accommodate any experimental result, so, on philosophical grounds, no longer science . 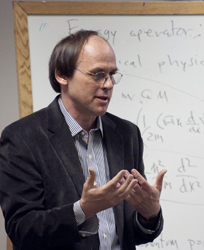 He included a video clip of Richard Feynman characterizing this sort of thing as “cargo cult physics.” On the final day, David Gross interpreted Steinhardt’s talk as implicitly applying to string theory, then went on to invoke a philosopher’s new book to defend string theory, arguing that string theorists needed to read the book in order to learn how to defend what they do as science .